In an ongoing suspicious-package string, the US has been intercepting a number of suspicious packages, containing rudimentary but functional explosive devices, sent to a number of prominent American public figures. So far, explosive packages have been sent to former US President, Barack Obama; former Secretary of State, Hillary Clinton; CNN, addressed to former CIA Director John Brennan; former US Attorney General, Eric Holder; New York Governor, Andrew Cuomo; Senator Kamala Harris; billionaire investor philanthropist, George Soros, and others. 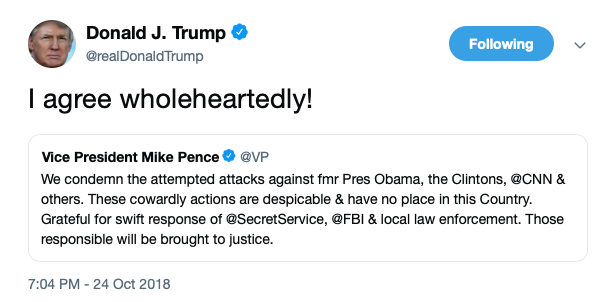 US President, Donald Trump, said in his first official statement, that he agrees "wholeheartedly" with the Vice President, Mike Pence, condeming the attacks. 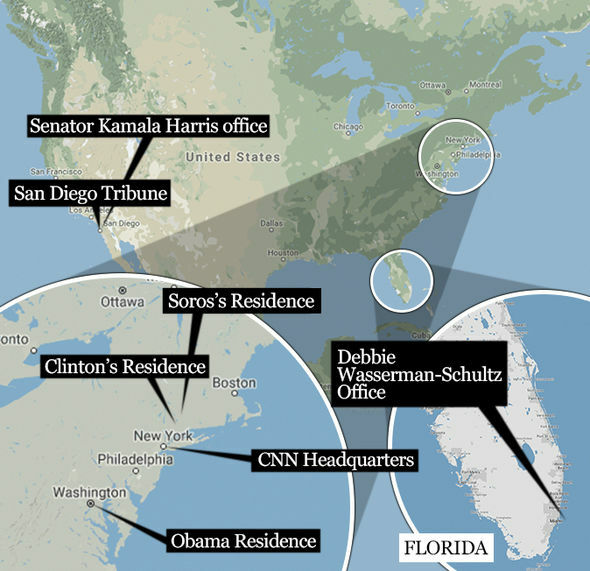 As one suspicious package after another are being discovered across the states of America, the first reported one arrived at Soros’s residence in New York on On October 22, 2018, containing the same bomb in today’s developing story. Earlier today however, October 24, 2018, a package was sent to Obama's residence in Washington DC. The Obamas refused to comment if they had been at home when the delivery took place. 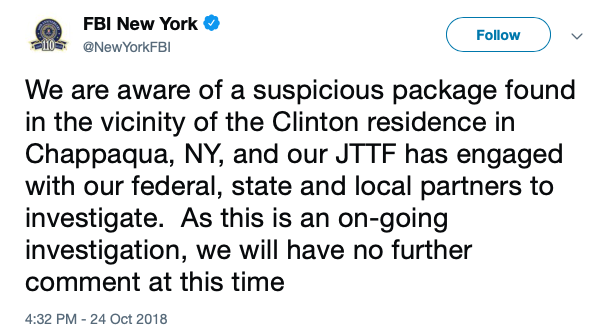 Another similar package was sent to the Clintons’ in New York; and while Mrs. Clinton was campaigning in Florida for the Democrats, Former US President, Bill Clinton, was at home. 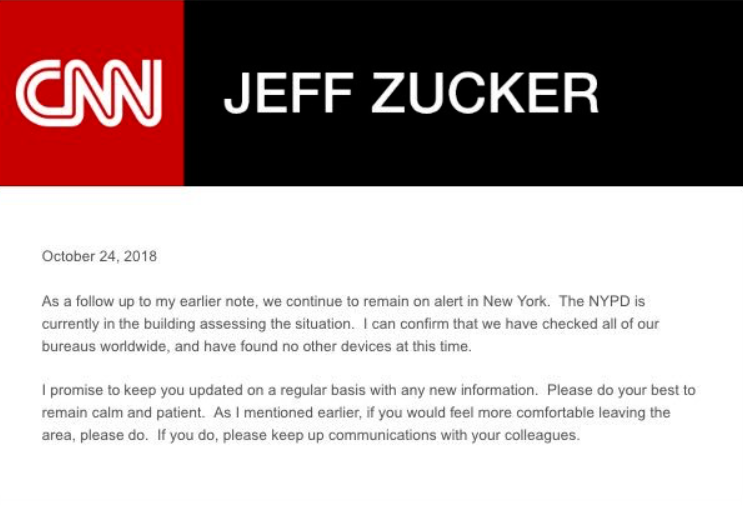 Another package was sent to the CNN’s offices in the Time Warner Center building, in New York. It was discovered in the mailroom by an X-ray scan, addressed in care of the news network, to a CNN guest, former CIA Director Brennan. New York Police Department (NYPD) Commissioner, James O’Neill, said the package addressed to Brennan "appeared to be a live explosive device." 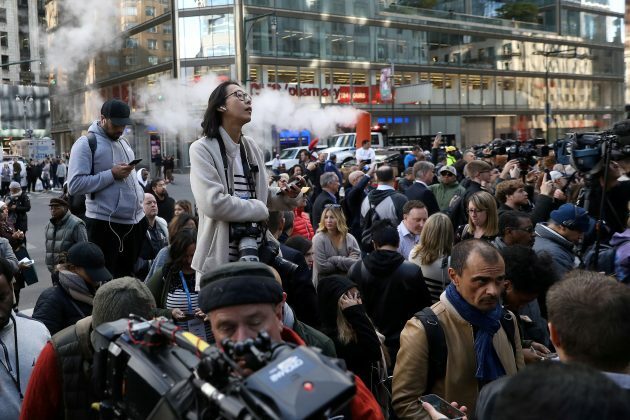 Just as the news broke out about explosive packages sent to Obama and Clinton, security measures led to the evacuation of the Time Warner Center. 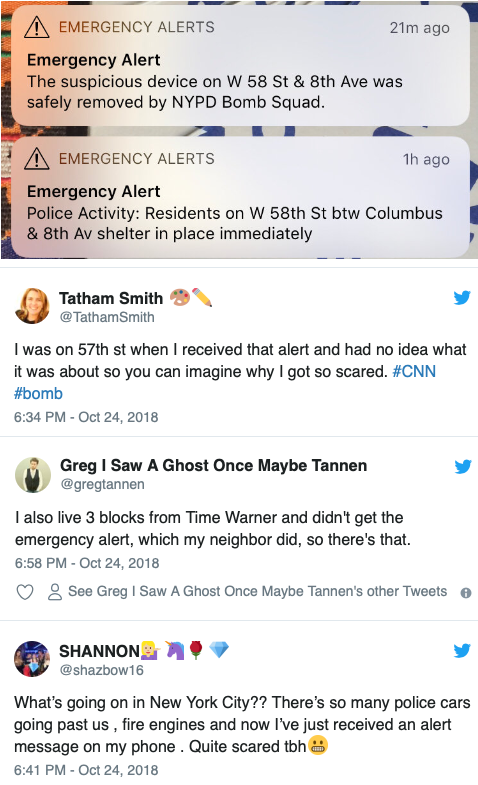 CNN was, live on air, breaking the news of the other bombs, when the evacuation alarm went off, directing all employees to evacuate the building. The police later found a live explosive device and traces of white powder inside the building. 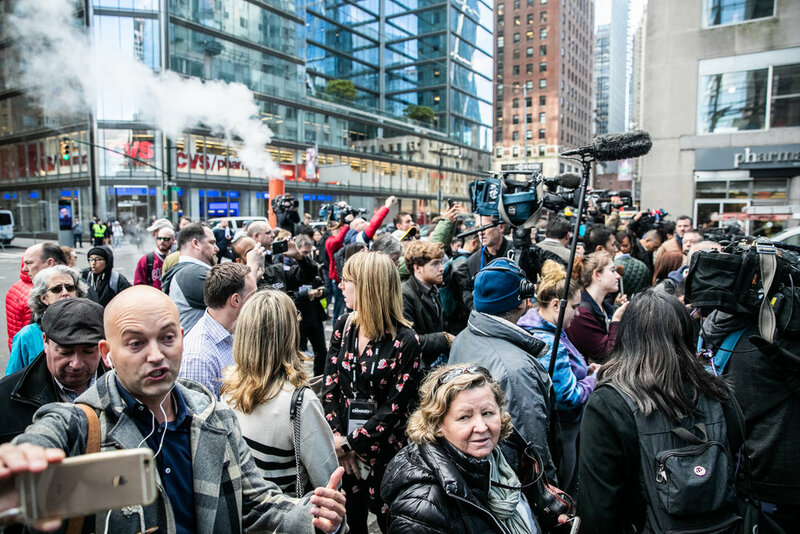 An NYPD bomb containment unit removed the bomb from Time Warner Center as a two block parameter was set around the complex; pushing the public away. The NYPD has now increased patrols at other major NY newsrooms. In Washington DC, a suspicious package was intercepted at Capitol Hill, intended for Rep. Maxine Waters. In a twist, the New York Governor Cuomo, announced in a press conference in front of the Time Warner building, that his office was also sent a “device”. Later, an official in the NYPD said that the suspicious package in question has been cleared as it contained informational literature. CNN earlier reported that a similar package was addressed to the White House, which was intercepted at Joint Base Bolling. According to a law enforcement official, the device inside was similar to the ones sent to Soros, Clinton and Obama, appearing rudimentary but functional, and containing projectiles made of glass shards. While a peace officer stated that “there is a strong suspicion” that all the explosive packages are connected together. 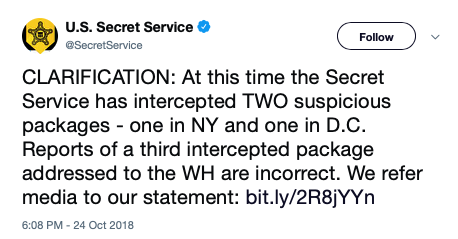 However, the US Secret Service (USSS) denied any White House attack, and clarified in a statement that (at the time) the USSS intercepted only two packages, addressed to Clinton to Obama. Another package found was addressed to former US Attorney General, Eric Holder. However, it had the wrong address and was returned to the return label on the package; accordingly reaching the office of Congresswoman Debbie Wasserman Schultz in Florida. Similar to the ones addressed to Clinton and Obama; there was no information of the sender.